If you dont like it, save the rest and use it for cooking. I'd buy some mussels and use it for that purpose. Fine chop some onions, mince shallot, fine dice carrot. Finish the sauce with a dab of butter. Wow. That's amazing. Not at the level of Alexander for me, but at that price I would definitely pick them up. That's kind of sad. At least I still have my Alexander. Yesterday I saw a special edition of the La Folie and a couple of their other beers, "foedre aged," but no mention of whether that one is also pasteurized. CBS a once impossible beer seems to be plentiful around here right now, they must be cranking it out? Picked up some bba Expedition stout yesterday which I’m looking forward to this weekend. Roasty roasty goodness. Always love what a little age does to these. Interesting, Jerome. The last couple 2012 Courage RIS I had were over the hill, to my tastes. Did they stop importing the courage? 2012 was the last I’ve ever seen. I have a bunch of 2010-12 so I hope the aren’t over the hill. Aren’t these supposed to last many many years. I haven't seen past 2012, either. For my preferences, the 2012 has seen better days, but I've also come to realize I like the sweetness that age brings to big stouts, but not the iron-like/mineral notes. I've found those mineral notes develop after the sweet/brown sugar notes, so the trick for me is finding that sweet spot in the aging continuum. If you enjoy those mineral notes, then the beers will last much longer for you than they do for me. That's exactly why I like it. I am not a big sweet stout fan, so I really look more for the roasty bitter coffee ground/espresso dark chocolate flavors. The sweetness that used to be there is definitely mellowed out and brought out the bitterness for me. I can see why someone could dislike it if that wasn't what they were looking for. If you like to drink your coffee with a little bit of cream and no sugar, then this is the stout for you now. I'd crack one open. Been enjoying any number of new Colorado and Wyoming craft breweries' product lately. Neat to see such a increase in the local quality ale, in a region with a nice craft ale history. So vibrant. Jerome, I may be wrong on this, but my recollection is that Oskar Blues is one of, if not the, oldest craft breweries in Colorado. They produce some nice stuff. Last night I was enjoying a number of IPAs produced by a new Bloomfield Colorado craft brewery, 4 Noses. Really tasty stuff. I'm not sure either, but I love almost all the stuff that comes out of Oskar Blue. Never heard of 4 Noses as I don't get that much stuff out here from Colorado, except some stuff from Crooked Stave, which I do enjoy from time to time when I want something funky. One of the selections I passed on yesterday, as I was picking up craft ale at my favorite ale store in Fort Collins (Supermarket Liquor) was stuff from Cigar City Brewing out of Tampa, Florida. Talking with the store's beer guy, he let me know Oskar Blues just recently bought Cigar City Brewing. I may pick some of that up next time I am down there buying ale. and Soul Squared Brewing Company ("Soul Squared Brewing Company is Colorado's original farm based brewery located just north of Fort Collins and west of Wellington. We focus on using ingredients from our farm and locally-sourced ingredients to create freshly crafted beer with unique seasonal styles in true farm fashion. Our name comes from belief in the exponential power of the local community and our farm-based approach to craft brewing. Our Community x Our Brewery = Soul Squared."). I've been drinking a lot of their IPA Rocky Mountain Haze. Sadly, it was out of stock yesterday at Supermarket Liquor. One of the local breweries the beer guy highly recommended is in Greeley, CO, and is named WeldWerks Brewing. The beer guy was telling me they do "small batches" and are constantly switching up their available selections. I picked up two of their IPAs, "Juicy Bits" and "Hip To The Lingo" and will try one or both tonight. Wow. Cigar City and Oskar Blues together? That's actually pretty awesome. Two breweries that kind of get shunned by beer snobs because they are so readily available. Heater Allen Sandy Paws Baltic-style Porter 2018 - always one of my favorite HA beers and this year’s batch is no different. In fact, from a purely flavor POV this may be the best one I’ve tried, but 2014’s batch will always be my sentimental favorite. Last edited by Scott Tallman on November 12th, 2018, 10:27 pm, edited 1 time in total. Cracked a can of Evil Twin's Imperial Biscotti Break from last year, last night. Unfortunately a drain pour as it tasted extremely sour and metallic. Shame. Noci!! Glad you like it Scott! 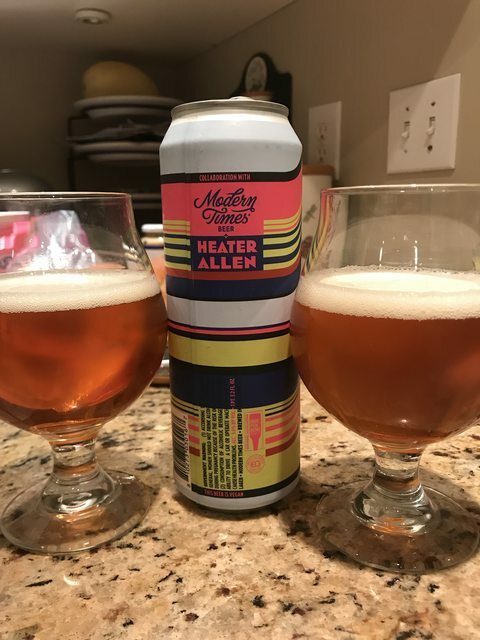 Modern Times, Heater Allen Tent Bier. Lager/Marzan styled hybrid 5% ABV. Vienna and Pilsner malts, and a bit of Munich and Carabohemian, hopped with German Tettnang hops. Beautiful copper orange color with a nice wispy white head. Very floral, with notes of crackery sweet malt. This drinks like a hoppy lager, I also pick up a faint lemon note mid-palate, uber refreshing and absolutely crushable with zesty refreshing carbonation. Bone dry and clean as a whistle, I love this and am glad I bought a few extra four packs as this is a perfect food beer for the upcoming food fest ahead. Well done HA and MT. I'm enjoying a Fremont IPA. As Scott will tell you, that's worthy of celebration these days. In fairness, it's a collab with an east coast brewery (Night Shift, based in MA) called "Stranger in a Strange Land." Hazy Imperial IPA, which I haven't seen a lot of. Really enjoying it - fruity, bitter, but not a malt bomb. Might have to go buy more of this, as I'm off next week! Had the CBS last week at the local Whole Foods. They had it on tap, and they had bottles for sale. Comes in a 750ml bottle!!! At almost 12%, that's too much. Couple days later, they still had a stack of bottles for sale. First time I've had it. Expected more maple, instead, it seemed really big on coffee. Really nice sour. Lots of depth. Similar to the "spit beer" from Peru. Actually uses the Peruvian corn, but minus the spit (thankfully). Still sour, but a sweeter sour, and very low in alcohol. Drinking a Modern Times Space Ways at the moment. Time in can is starting to take its toll, relative to where it was a month ago (spectacular). When a Fremont <anything> beats out an MT beer, something is wrong. Fair State brewing out of my native Minnesota teamed-up with Modern Times to brew a *fantastic* hazy IPA! I've been loving on that one. In addition to that one, my local Total Wine had at least two other Fair State beers, and I bought those, too: a hazy IPA (very good) and a Saison (excellent). a hazy from Revision that's excellent. that might be all worth mentioning, for the time being. Tried this on release. Can’t say I liked it as much as you, but definitely a big step up from the other Fremont hoppy beers (save Cowiche Canyon, which was phenomenal this, both the regular and hazy versions). One other Fremont shout out - their Dark Star Imperial Oatmeal Stout on Nitro is delicious. Popped this beauty after forgetting about it in the back of the fridge for a couple of months. First time for this, and this is already one of my favorite Trilliums. Deep hazy color, yeast floaties settling to the bottom, bit of a piney nose and aftertaste, but headstrong orange citrus dominates (though smoothed out maybe by the genius of my forgetfulness). Balanced, nothing harsh, delicious. Yum! While we’re doing Fremont shout outs, Pub 85 in Kirkland had the Head Full of Fresh Hops on tap, which was good but not great imho. Also had a Boneyard Notorious (served in a pint glass) which is probably my favorite triple IPA out there. Picked up more Stranger in a Strange Land and MT Bedrock at Total Wine. Should be a fun Thanksgiving. Picked up this year's vintage. As funky and delicious as ever. Looking forward to doing a side by side with a 2016 i have in the cellar. Interesting post Jim. I've had plenty of Trillium over the years but nothing older than say a month old. I truly believe that a lot of these super hopped NE styled IPA/DIPAs actually get better with some time on them, for me my local is Monkish and I actually prefer Henrys super hoppy beers with at least a couple weeks on them and most are prolific at a month out, I haven't gone much deeper than that though. I don't know if this is appropriate for here, or if it is 100% true yet, but it is from an account that I do trust. And if this is all true, it is very disturbing indeed. LOL! I looked it up on Reddit and I feel much better to see that beer threads are as bad as wine ones Pages and pages on donkey consumers driving up prices, marketing gimmicks and beer art; I should start my own brewery! Everyone's entitled to their opinion. Even when they're wrong. Not a fan of Deschutes Stoic, but I just got five more of these and I can drink them allllllll day. Really? ... BCS is (was?) dead to me now. I noticed a significant drop in quality when in-Bev took over. And, iirc, the 2015 always struck me as a touch sour --- something clearly went wrong with it. No sour in it now. Chocolate-caramel across the board. If anything, it was a little flat. In Chicago, got a case at Garfields, could of bought a couple of the Variants but passed. You think that pasteurization has anything to do with it now? Picked up a few of this years and a wheatwine cause... why not? But I was way more excited to pick up a 4-pack of the Carton Epitome. No idea. I can tell you they were bought in CA upon release, went two months unrefrigerated in a garage during the summer and then stored in a dark room at 60 degrees for two years. Provenance hasn’t appeared to affect any of the other beers, but who knows? Melvin Citradamus Imperial IPA - not as good as I expected, especially based off the BeerAdvocate rating. Heavy malt and no real citrus? Fremont “The Rusty Nail” - Less cherry than previous years, but same KDS like profile of chocolate and vanilla, but a little bit of mint when I breathe out. I need some ice cream to put this on. The liver is evil; it must be punished.